The plot is just another varianet of the run-errands-for-your-master plot adventure game veterans have seen too many times already. But it is the gameplay that counts, and the wonderful sense of humor and great cartoon style of Apprentice will keep you glued to the screen, cliche plot notwithstanding. The game is unfortunately far too short and too easy - I finished it in less than 1-2 hours - but it was definitely time well spent. 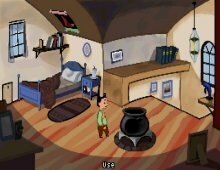 Highly recommended for adventure game fans everywhere, especially those who miss the good old days of LucasArts. Two thumbs up for this snack-sized underdog, and be sure to check out the longer and better sequel called Apprentice II.